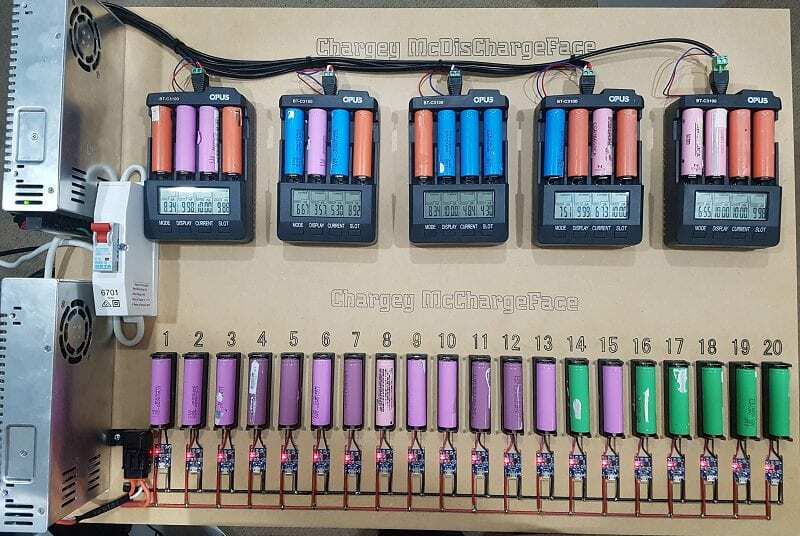 Why has the blog been so quiet I hear you ask…..Well…I started work on a DIY Powerwall from recycled laptop batteries. 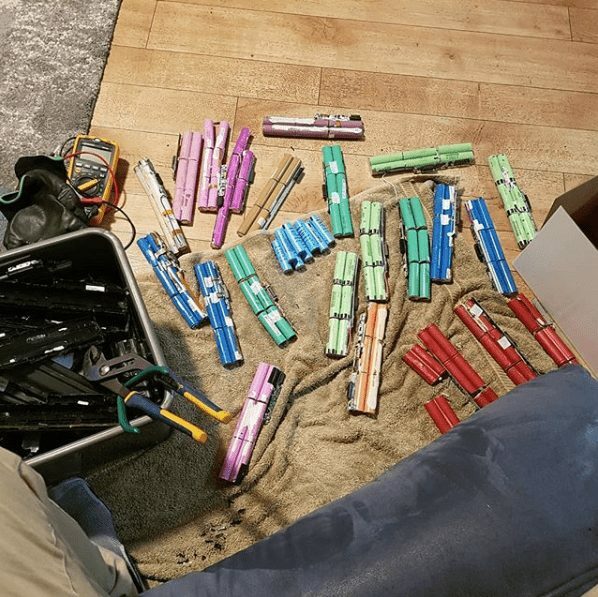 Yes, you heard correctly, I have started building a Tesla style power-wall from 18650 batteries. These are commonly found in Laptop battery packs. A why would I do such a thing, I hear you ask… In a nutshell, I want to save on electricity bills by using Solar a bit smarter and storing the energy for later use. I also wanted to see if it was possible to build a reliable/equivalent power-wall at a fraction of the cost of a Tesla style power-wall. After a small bit of research, I stumbled across two resources that have become staples in my DIY Powerwall diet. Those are the “Second Life Storage” forum and the “HBpowerwall” Youtube channel, run by Peter Matthews. Using these two resources you can find out just about everything you need to know about building your own power-wall. Check out the links. Also, check out my journey below. Some of the DIY’ers find this step one of the most difficult. 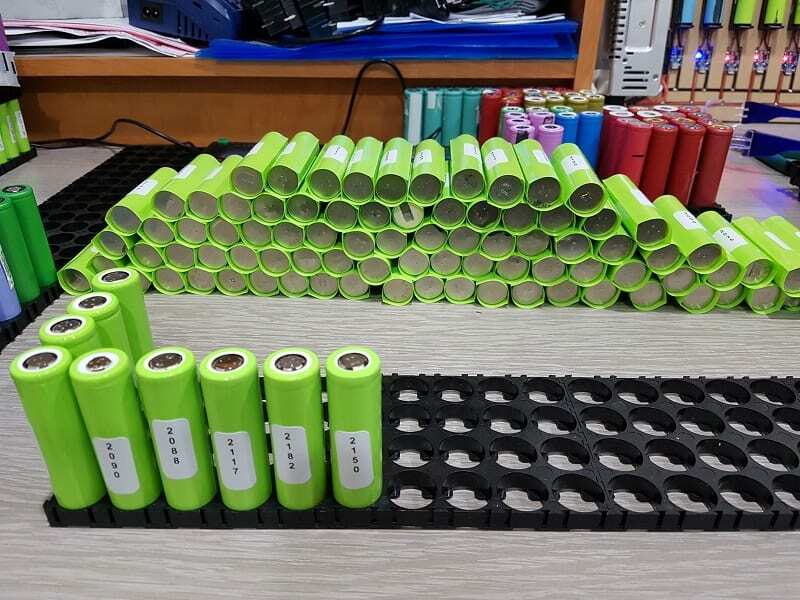 Finding laptop battery packs to recycle the 18650 cells from can be tricky. I approached a few battery stores and computer stores but most seemed disinterested in selling me the old packs. I am not sure if it’s a health and safety thing, or they get more recycling them. 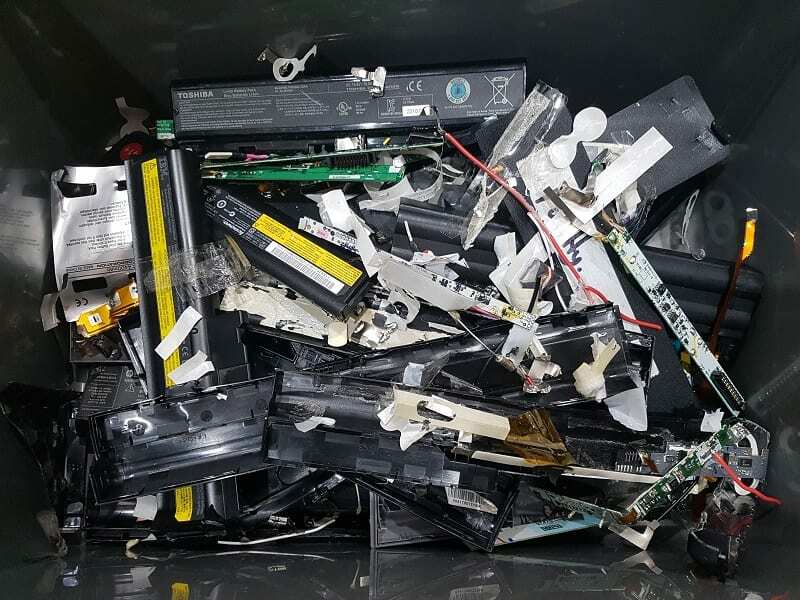 However, after finding the right people through a few Facebook groups I was able to get a steady supply of laptop batteries through an IT recycler. At first, I purchased 20Kgs of batteries not knowing what I would get. But then went on to purchase 30kgs, 40kg and most recently 60kgs. The break-down of how many usable cells I actually got from these old laptop batteries is below. The end state of pulling the laptop batteries apart is to get the singular 18650 batteries out. Once we have them out and ready to go we can begin to analyse them to see if they are suitable for our powerwall. 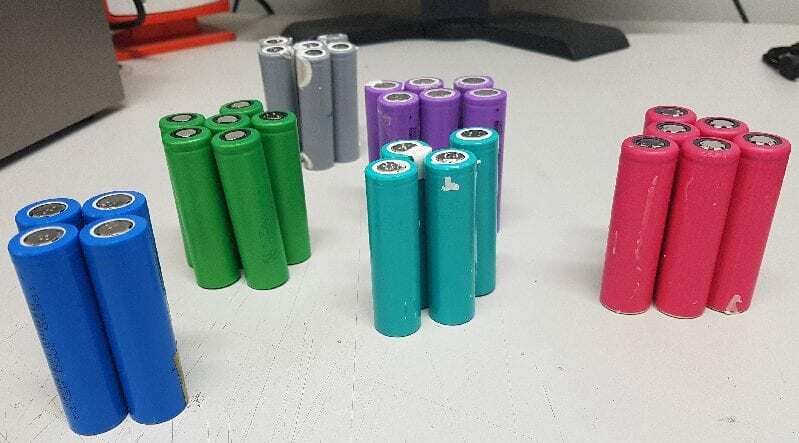 Noting that these batteries did come from old laptop batteries we really do not know what state they are in, we must “process” the cells to determine the capacity of every cell. Also, try and detect the bad from the good cells. 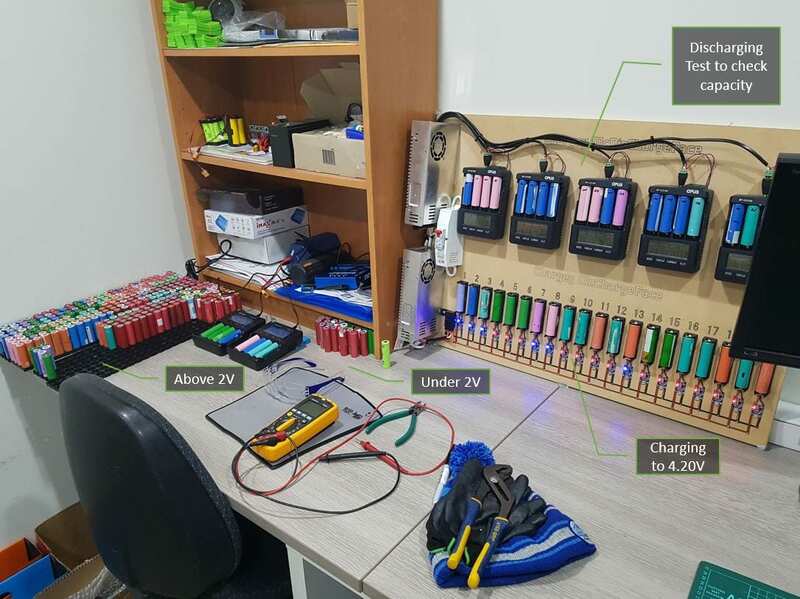 Once you have started your journey to building a DIY powerwall, you will no doubt need to process bulk cells to weed out the good from the bad. There are many ways to achieve this outcome, however, I will give you a rundown on how I am doing it. (And a basic guide to budget required for processing.) This part is easily the most tedious part of the build. For example, if you decide you would like a 48v 10-12kwh powerwall then you are looking at requiring 1400 cells at a minimum. 1400 may not sound like many, however, after weeding out the bad cells, you soon find that it does take time. For the cells that pass the 2v test, they will then be placed into the cell holders attached to the TP-4056 chargers. These small lithium specific chargers are very cheap and an ideal way to bring any old batteries up to full charge. You can pick these up from eBay very cheap in packs of 10-20. I went with 20. Once the cells are charged to maximum voltage, the cells are then cycled into the Opus chargers for a discharge test. This is will give us the remaining capacity of the cells. Basically, it ensures that the cell is at 4.20v, discharges the battery to 3v, records the capacity in milliampere hours (mAh), then charges the battery back up to 4.20v ready for the next test. Once we know the remaining capacity of a cell, we then write it on the side of the cell for future reference and we also notate the current voltage of the cell at the time. The cells are then placed into tubs grouped by capacity and left to sit for a minimum of one week. The reason for this is that we want to identify any cells that can not hold their voltage. These are known as “Self Dischargers” we do not want a cell in our packs that cannot hold a charge/voltage. This can have significant effects on our packs once built. It will depend on a lot of factors how you will proceed with building your packs. Each choice will have pro’s and con’s. Go with the method that best suits your cell count and abilities. At present, I have not 100% decided on the method I am going to use, however, I am re-wrapping the vast majority of my cells first. Once I have 1400 quality cells, I will then arrange them into 14 packs of 100 cells. (14S100P) This will give me a 48v nominal power-wall around the 10-12kWh. So where am I at right now… Well I have processed approximately 60Kgs of recycled laptop batteries. I set my limits for the cells to go into my wall at 2000mAh. I currently have 4 packs with 100 cells in each pack. If I lower my standards to 1800mAh I could probably have a 5th pack built, but for now, I plan to stick to the magic 2000mAh in capacity for my wall. Some tips and tricks for better pack build. Solar/Inverter installation and connection to battery packs.